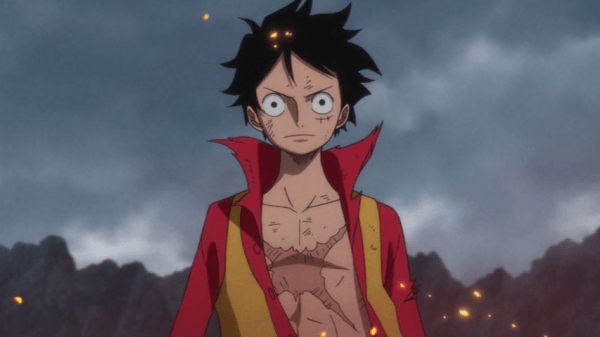 With a series like One Piece running for almost two decades, it is inevitable that a number of movies are created in an attempt to cash in on the fans that have followed such a series. However, many of these movies are just that, cash-ins that offer little actual entertainment value for anyone but the most die-hard fans of the series. 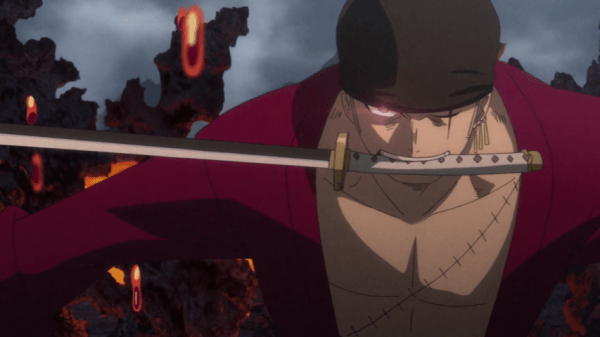 While the last movie, One Piece: Strong World, was an enjoyable enough offering with some flaws, how does One Piece: Film Z stand? The Marines are a force to be reckoned with. Not only do they have a vast army but many of their top admirals are blessed with powerful Logia Devil Fruit powers. It also seems that they have a secret weapon called the “Dyna Stones” that have been kept hidden away due to their immense destructive power rivaling that of the Ancient Weapons. Unfortunately, the island housing the Dyna Stones is being assaulted by a man and crew that appear to have a death wish, as they invade the island in a scene reminiscent of Normandy, and steal the Dyna Stones from the marines. You see, the man leading this band is Z (pronounced Zed), and he has plans that will annihilate everything in the New World, and after surviving his fight on the island on a piece of flotsam, Z encounters the Straw Hat Pirates. 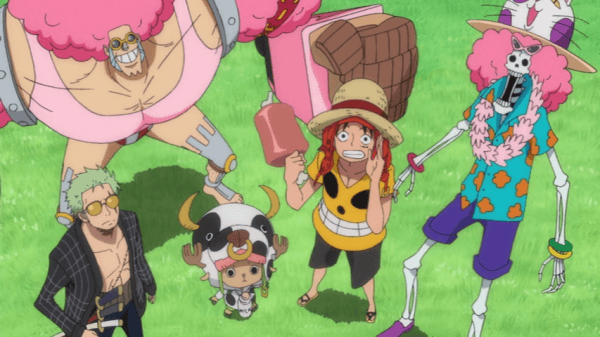 With the help of his crew and a powerful Sea Prism Stone arm, Z manages to lay waste to the Straw Hats and leaves three members of the Straw Hats afflicted by a curse before continuing on. With Luffy and the rest of the Straw Hats having their own reasons to fight against Z and the Marines moving in to put a stop to Z’s plans, what drove this former admiral who was once seen as a father to many of the top admirals to become what he is today? While shōnen series generally feature generic villains when it comes to their movie adaptations, Z is one of the best antagonists I have seen used in a one-off movie. From the beginning of the film we are shown that Z is already suffering from the use of his arm and while he comes off as a powerful enemy, he is much more than that. We are shown what he is and his conviction for completing his plan and over the course of the movie we learn how he became the man he is today in a painful story of a man who sought justice only to see that same system betray him in the end. 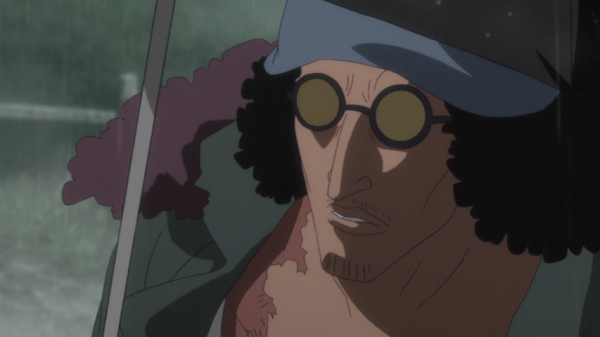 Rarely do you see a character this established in an entire One Piece story arc, let alone an hour and forty five minute movie. There are some issues with the movie that do stem from Z. You see, because we learn of his backstory as well as his connection to the current batch of admirals, almost every other character is pushed aside. Z’s two main comrades are simply there to provide a bit of extra padding to the fights and initially draw the Straw Hats into following Z and although there are hints that the two of them have misgivings about the life they have chosen, it is never delved into. The same can be said about the Straw Hats. Luffy’s drive remains the same throughout his confrontations with Z, but although this fits his character, being placed next to someone like Z shows how thin his motivations are. Thanks to the large number of fighters on the crew, once again only Luffy, Zoro, and Sanji serve any purpose in combat. Even then, the concepts of the battles these three are involved in are as simple as can be and don’t really step outside the box. The rest of the cast spends most of the time sitting on the sidelines and fighting against cannon fodder enemies. While it is understandable that a few may not be able to fight due to their conditions, there is a missed opportunity in the form of Usopp, who primarily uses plant based weapons projectiles as weapons now, not be paired off against Z’s plant controlling comrade. Once everything is said and done; it feels like everything is resolved far too simply. The secret of the New World remains unprotected now that many people know of it and the damage that was done is seemingly forgotten while the characters involved in the battles are left hanging with no special developments as the film returns to the status quo. As has become something of a standard for One Piece movies, all of the Straw Hat pirates go through a number of costume changes throughout the film, including a few changes in anatomy with Nami being the most altered character of the film and Robin being used mostly for comedy. Z’s design is fitting to his backstory and personality and the way that his weapon looks is not only unique but also fairly intimidating. The fights in Film Z reach some very high levels of production at times, with some of the battles looking extremely similar to something one would see in a Warriors game with one man plowing through hundreds of soldiers with spectacular camera work. This same camera angle is used to make a few of the final battles look incredibly detailed, but there are still some very obvious lows, with the quality taking a drastic dip in the form of cartoonish out of place explosions in the final minutes of the movie. With the release of One Piece: Film Z both the English and Japanese voice tracks are included for the viewer to choose between. The English voice cast for all of the main characters return to reprise their roles while Z is voiced by Jeremy Schwartz who does a stellar job bringing the character’s personality and motives to life. There are a number of decent sounding pieces of background music used throughout the film, while a haunting hymn to fallen Marines is sung a few times throughout the film. It is worth noting that the credits for the film also contain cover songs of “This is How You Remind Me” and “Bad Reputation” sung by Avril Lavigne. 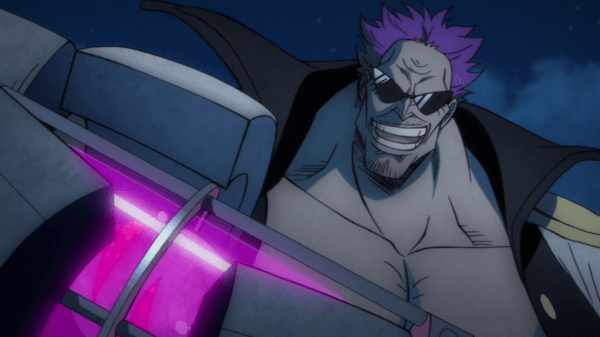 The special features included in FUNimation’s release of One Piece: Film Z are mostly standard inclusions, such as Japanese promotional videos and trailers, but also included with this release is “Patrick Seitz at Sakura-Con 2014.” This roughly nineteen minute long extra focuses heavily on Patrick Seitz,, the English voice of Franky, as they interview him and show him speaking at the show. 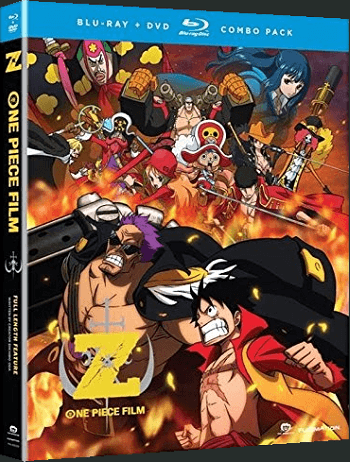 What makes One Piece: Film Z great is right there in the title. Z is an antagonist that the viewer can not only sympathize with but also a well-developed character with clear motives and a never say die attitude. With high stake battles spread throughout the latter half of Film Z, the action is dialed up a notch, even if the actual fights remain too similar to one another to stand out. While the story may have good pacing and build-up, it is unfortunate that outside of Z, we see very little involvement or development from anyone else in the storyline despite the fact that quite a few familiar enemies appear thanks to their past connections with Z.